Owen was born on 18th March 1893 in England. From an early age Owen displayed a keen interest in the arts and began experimenting with poetry at the age of 17. After failing to attain entrance to the University of London, he left for Bordeaux in France to teach at an English school. During the latter part of 1914 and early 1915 Owen became increasingly aware of the magnitude of the War and he returned to England in September 1915 to enlist in the Artists' Rifles a month later. He joined the Manchester Regiment (5th Battalion) in June 1916, and spent the rest of the year training in England. 1917 in many ways was the pivotal year in his life, although it was to prove to be his penultimate. In January he was posted to France and saw his first action in which he and his men were forced to hold a flooded dug-out in no-man's land for fifty hours whilst under heavy bombardment. Owen’s early poetry talked about the glory of fighting for your country but his horrific experiences in France opened his eyes to the appalling conditions that the soldiers fought (an often died) in. In March he was injured with concussion but returned to the front-line in April. In May he was caught in a shell-explosion and when his battalion was eventually relieved he was diagnosed as having shell-shock ('neurasthenia'). He was evacuated to England and on June 26th he arrived at Craiglockhart War Hospital near Edinburgh. The period in Craiglockhart, and the early part of 1918, was in many ways his most creative, and he wrote many of the poems for which he is remembered today. 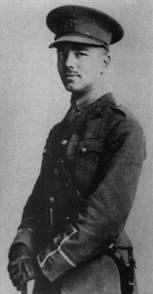 In June 1918 he rejoined his regiment at Scarborough and then in August he returned to France. He was awarded the Military Cross for bravery at Amiens, but was killed on the 4th November whilst attempting to lead his men across the Sambre Canal at Ors. The news of his death reached his parents on November 11th 1918, the day of the armistice.